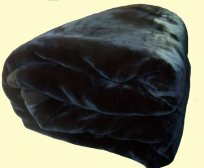 Wonu Safari Blankets are among the softest and most luxurious Korean mink blankets on the market. These Korean blankets are much better quality than regular brands, such as Dolphin, Apple, etc. This Wonu two-ply mink blanket is very soft, thick, and luxurious. Its extra thickness will provide year-round comfort. Softer and heavier than Solaron blankets. Reversible. Approximately 14 lbs of comfort. Available in several colors. Measures 86 X 94 In. Made by the Wonu International, using premium Korean technology. Machine Washable .